Eco-Systems Sustainable Exhibits, an innovative leader of contemporary design-driven green displays, is excited to announce the addition of Tom Beard to the Eco-Systems team. He comes on board as their National Sales Manager leading the sales and marketing for the company. Tom has over 20 years of experience in the trade show industry. In addition, he is also very involved with the Experiential Designers and Producers Association (EDPA), currently serving on the Board of Directors. Look for Tom at EXHIBITORLIVE 2018 in booth #1925. For more information about Tom’s extensive industry background, see his LinkedIn profile. You can contact him at tom@ecosystemsdisplays.com. Eco-Systems Sustainable is based in Grand Rapids, MI with production and project management in Portland, OR. Eco-Systems designs and manufactures eco-friendly exhibits using green materials such as FSC wood, aluminum extrusion, recycled EcoBoard and plex, LEDs, and low VOC adhesives. See www.ecosystemsdisplays.com for more information. The Eco product line can also be found on Exhibit Design Search in the eSmart Gallery. A year or so ago, we added two galleries to Exhibit Design Search: Rental Furniture #1 and Rental Furniture #2. These galleries are a subset of CORT’s trade show rental furniture. They were created to make it easier for you and your client to select contemporary rental furniture without having to complete the typical GSC forms. Your client is your client. They should be working directly with you, not with the GSC. As Classic Exhibits Distributors, you have access to these galleries at preferential wholesale prices, merely by mentioning that you are a Classic Distributor. CORT processes orders based on regions. 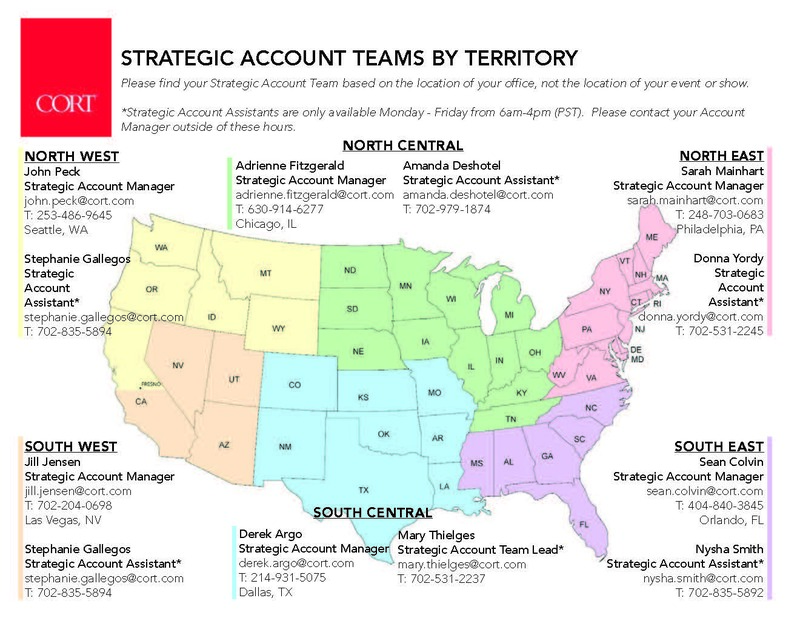 The map below shows the regions and contact information. Or you can call the main number, 855-663-2678, and they’ll route you to the appropriate individual. Need the PDF version? Download it HERE. Classic Exhibits Inc. designs and manufacturers portable, modular, hybrid, and custom exhibit solutions. Classic Exhibits products are represented by an extensive distributor network in North America and in select International markets. For more information, contact us at 866-652-2100 or www.classicexhibits.com. 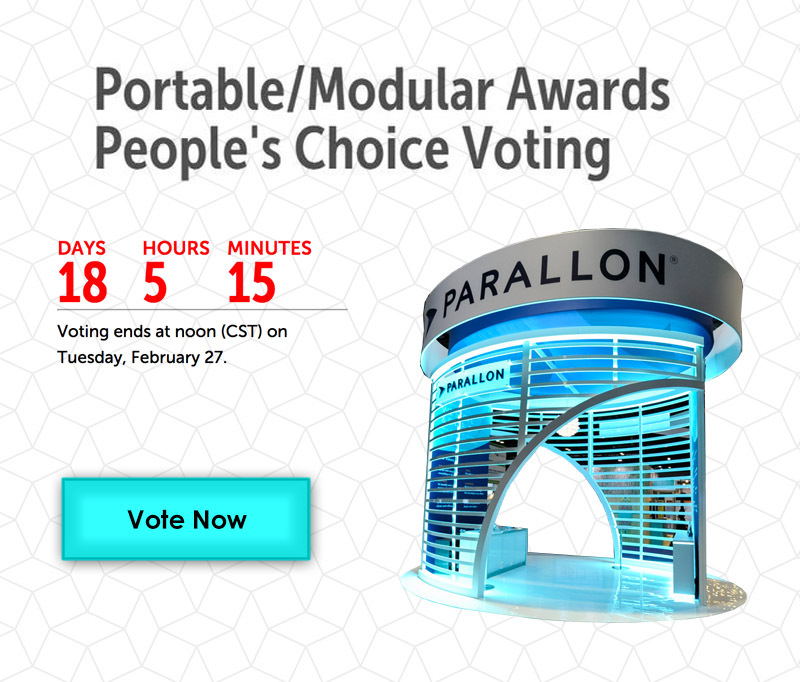 The Fifth Annual Portable Modular Awards (PMA) Ceremony is just a few weeks away (February 27). And this year, it will be more visible to the EXHIBITORLIVE attendees. EXHIBITOR Magazine has moved the ceremony to The Connection Zone at the entrance of the show hall. Same time, same day as before — Tuesday, February, 27 from 3:45 to 4:45 — just after the show hall closes for the day. The new location plus the inclusion of the Find It– Top 40 winners will boost attendance considerably, especially custom houses. If you are attending, I would suggest grabbing a seat once the show hall closes at 3:30. If not before. Once again, Classic Exhibits has entries in multiple categories of the PMA. See our entries, along with all the others, on the Peoples Choice page. Please vote for your favorite. You can vote once a day (and on multiple devices if you are truly committed). There’s no RSVP required. The Classic Team will be sure to have boxes of Girl Scout cookies available in case you need a sugar fix after a long day on the show floor. Safe travels. See you in Las Vegas. p.s. Still need to register? Use Code 4044 for a free pass into the show hall. Over the past several months, Kevin Schuhl, a Classic Exhibits designer, has perfected 360° “Fly-Through” videos of Gravitee One-Step Islands. It hasn’t been easy, but the results are truly remarkable. I won’t pretend to understand the process, but I know from talking to him that it’s time-intensive. For each one, he has to create the flight path and the specific lighting. Then there’s the computer rendering, which he often launches before heading home or going to bed. After that, Kevin tweaks it multiple times to get it just right. Then it goes to Glenna Martin, our Graphic Design Manager, who adds the title slides, music, and text before uploading it to YouTube. The results are impressive as you can see below. Each video shows a full 360º view. Sort of like having a hovercraft on the show floor. HUGE kudos to Kevin and to Glenna. Below are three recent ones. To see them all, visit the Classic Exhibits Channel on YouTube. Think back to your first major trade show, either as an attendee or an exhibitor. I’m guessing it was overwhelming… and wonderful! There was so much to discover, so many new people to meet, each with a history and storehouse of knowledge. You quickly realized that whether on the show floor, at a breakfast with a client, or chatting with others at the industry gala, that those three days in Vegas, Orlando, or Chicago were special. You couldn’t replicate it sitting at your desk — not on a phone call, via email, or though social media. You had to be there… and you had to be fully present. Trade shows are a chance to learn and to change. It’s easy to forget that in our quest for the BIG SALE. I’m often asked, “Are trade shows are relevant?” Is there a future for industry trade shows? Do Millennials, or Gen Xer’s, or heck, even Baby Boomers, still want to attend them? Are companies willing to spend their valuable marketing dollars building a temporary structure just to attract new customers or meet with existing ones? In some ways, it seems a little old-fashion, as if video, live chat, online meeting spaces, and websites were never invented. So I understand, a little. Here’s what I know. The trade show industry is in a bi-polar transition. There are those who want change (and significant change) vs. those who are actively or passively content with the status quo. Most would contend that change is not moving fast enough. Fewer exhibitors are truly passionate about trade show marketing, and attendees are questioning whether to attend the same shows. That said… Face-to-face marketing isn’t going anywhere soon; however, it may be unfamiliar to many of us in as little as 6-8 years. Consider the recent announcement by the Recreational Vehicle Industry Association to scrap their 55-year old National RV Show. Consider what may happen if the worldwide economy continues to grow, along with corporate profits. How will those companies budget the F2F portion of their marketing and sales departments? On the other had, what would happen if the the global economy experiences another massive, albeit somewhat shorter, recession. Same question as before… How will they spend their limited budget? Who wins and who loses in those two situations? How will those two scenarios create change? If you are planning to attend EXHIBITORLIVE, please come with an open mind and a desire to discuss change. How will you thrive over the next 6-8 years regardless of the global economy, and what can we all do, individually and collectively, to move the ball forward. For far too long, we’ve been stuck in a Sisyphean mindset, one that’s no longer sustainable long-term. With this is mind, I thought I’d share a new word I learned from a Seth Godin post. Neophilia — a term popularized by cult writer Robert Anton Wilson, is a personality type characterized by a strong affinity for novelty. The term was used earlier by Christopher Booker in his book The Neophiliacs (1969), and by J. D. Salinger in his short story Hapworth 16, 1924 (1965). The ability to adapt rapidly to extreme change. A distaste or downright loathing of tradition, repetition, and routine. A tendency to become bored quickly with old things. A desire, bordering on obsession in some cases, to experience novelty. A corresponding and related desire to create novelty by creating or achieving something and/or by stirring social or other forms of unrest. A complete objection to or distrust of commitment. The opposite of Neophilia is Neophobia (an aversion to novelty or change). See you in Las Vegas in a month. If you need a FREE show hall pass, click on this LINK and enter code 4044.